“What is so beautiful about tap is the way dancers are moved to create their sounds.” Michelle Dorrance, 2017. 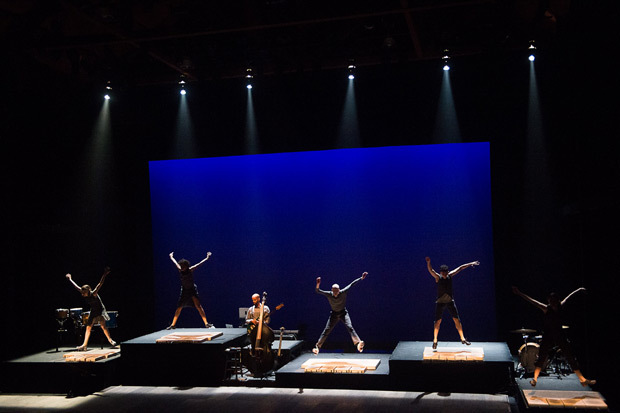 Dorrance Dance, established in 2011 by Artistic Director Michelle Dorrance, aims to honour tap dance’s unique history in a new context by upholding the traditional form while pushing its rhythmic, technical, and conceptual boundaries. The company had it’s UK debut at Sadler’s Wells 12-15 July 2017. ETM: Double Down uses electronic tap boards designed by company member, and long-time Dorrance Dance collaborator, Nicholas Van Young. Similar to electronic drum triggers, the boards are programmed to create different sounds when tapped, ranging from a snare drum to a note on an arpeggio. In this way, the dancers make the music as they tap, and the entire stage becomes an instrument. Stand out performances come from Warren Craft, whose movements seem impulsive, almost involuntary – beating out complex patterns with every twitch and jerk of his limbs. Where the other dancers project out to the audience, at times it is as if Craft is moving trance-like: that he would be tapping regardless, lost in his own music, were there no audience at all. A duet between Byron Tittle and Gabe Winns Ortiz is the first of it’s kind I’ve seen in the genre. Whether they are friends or lovers, there is a tenderness in their conversation, the taps, scuffs and beats show intimacy between the two, punctuated by outbursts of frustration where the heaviness of the intention weighs their bodies down into the ground. The audience is drawn in to their vulnerable relationship, worlds away from the usual call-and-response or competitive performance tropes familiar to tap enthusiasts. More could be drawn out of this, perhaps even as a stand-alone piece. Later, the dancers perform on individual sound boards using chains to add further texture. Ephrat ‘Bounce’ Asherie spends as much time in tap shoes as she does in trainers: an NYC b-girl who shows the connection between these two styles that have shaped American culture. Michelle Dorrance’s technique is flawless, changing between ripples, wings, compound beats, nerve beats and more at an incredible pace. 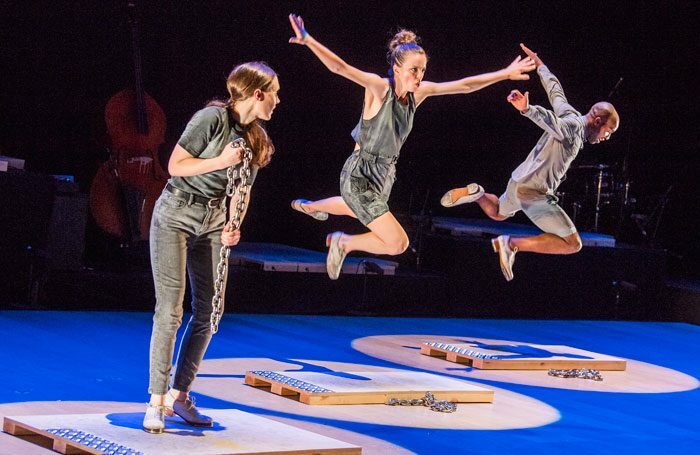 The company skid, leap, stomp across Young’s boards to create a score that could easily be sold on its own. Tappers are skilled musicians as well as skilled dancers – the artistry translates across forms – and ETM: Double Down demonstrates this perfectly. 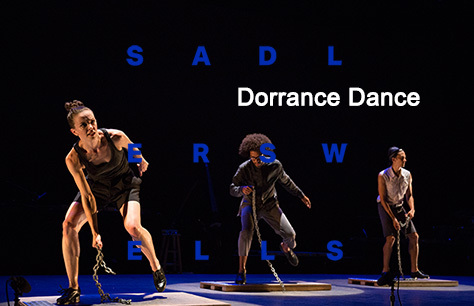 Check out Dorrance Dance’s future tour dates here and a Q&A with Artistic Director Michelle Dorrance here.